I’m always on the search for new things to do with kids. I’ve been hearing about The Art House for years, but only recently checked it out. And I’m so glad I did! It’s located in Muqsha, off of Janabiya Highway, behind Domino’s Pizza. (Note that Waze hasn’t quite figured it out, but Google Maps works well.) 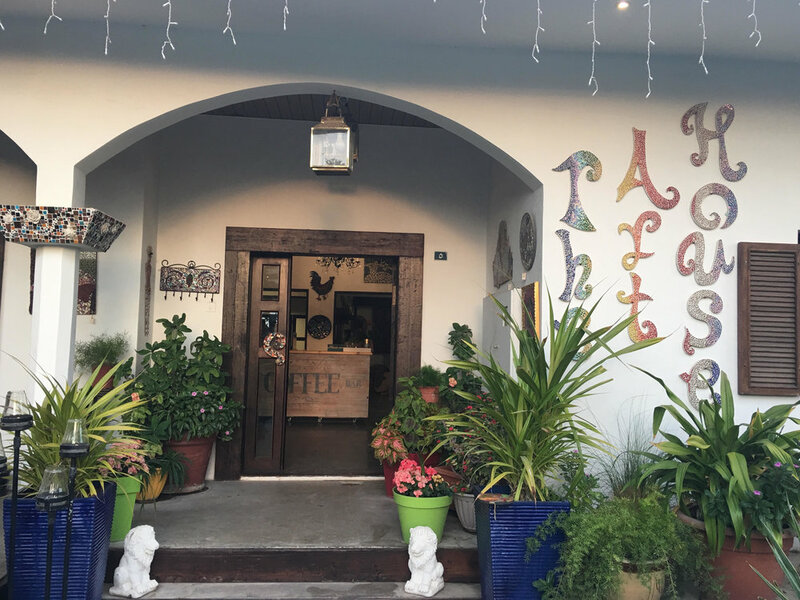 It’s in an adorable converted house that the owner, Ilsa, has made into an amazing space for creativity and artistic exploration. She has these fabulous pre-made patterns that kids can pick from. For just 6BD per pattern, she’ll help the kids get started and pick out their favorite colors of precut glass. She will then grout the pieces and once they’re dry, you can take them home! After the mosaics are done and waiting for grout, Ilsa introduces the kids to the “scratch patch,” or stone pool. It’s amazingly loud, but so much fun!! 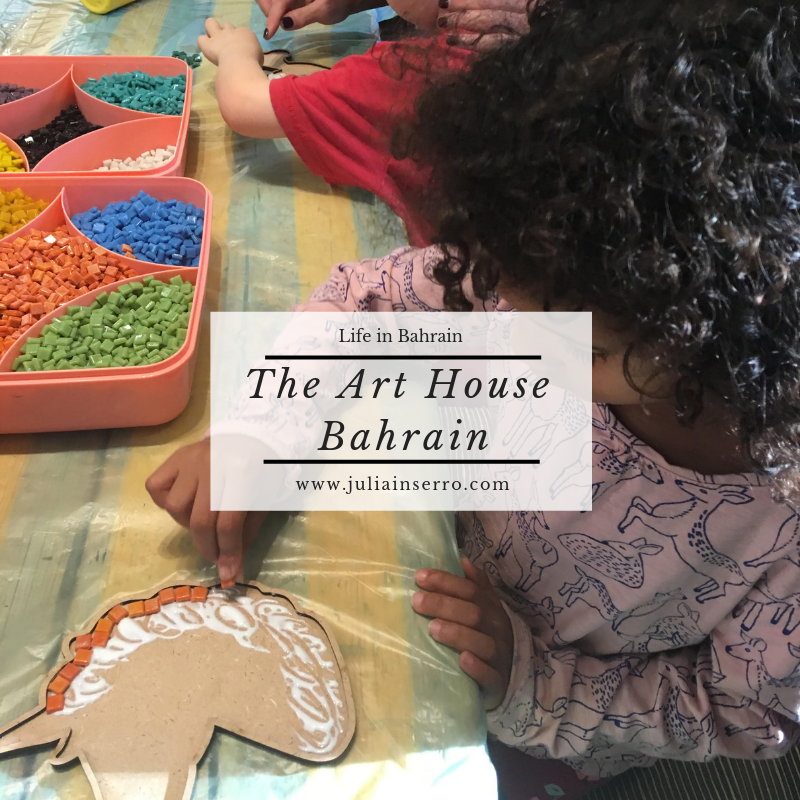 The Art House offers sessions for adults as well with a huge variety of pre-made patterns - from camels to cityscapes to hearts and flowers and turtles and seahorses and everything in between. In addition to all of this, she also offers space for birthday parties. For more information, or to just explore a new creative outlet, drop a note, give a call or just stop by. Their website is: http://www.thearthousebahrain.com/. There’s something about a farmers’ market. The smell of the earth, the friendly eager sellers, the colorful mounds of fresh fruit and veg, the sounds of inquiries and bartering. It’s like a sensory explosion. On our little island of Bahrain, we now have three options for farmers’ markets. There’s the Manama Central Market downtown (which you can read about HERE). Starting in December, there’s the seasonal Bahraini Farmers’ Market in Budaiya (which you can read about HERE). And now, there’s a Salmabad Farmers’ Market that seems to have the best of all of them – indoors and year-round. The Salmabad Farmers’ Market is located in Salmabad, near Zayed Town (kind of in the neighborhood behind Ikea). It is open 6 days a week (closed Sundays) from 8:00 AM to 3:00 PM. There’s a nice parking lot (this is important – the Budaiya one has horrible parking) and they offer shopping carts to use (you just need to give them your CPR to borrow it). It is smaller than both of the other markets, but truly how many stalls of cherry tomatoes do you need? But do note that it is identical to all other farmers’ markets in that whatever is fresh is what’s for sale. We bought some delicious grapes last week and were eager to grab some more this time, but no grapes to be found. Maybe they were sold out, or maybe they just weren’t fresh that day. But there’s always something yummy to grab instead. I found the sellers were completely fine using my reusable mesh bags, as opposed to their plastic ones. They can be a little eager to get your business, but aren’t too pushy. Many of them have samples out to try - we bought some amazing papaya after tasting a bite. We decided to forego buying the looz, despite repeated claims that they’re “delicious and sweet.” Neither I, nor my four-year-old son, particularly liked them. My four-year-old daughter refused to even try them and just eyed them suspiciously. They also have eggs, dates, some local cheeses, and plants for sale. In the middle, there’s a nice little cafe if you need a rest. It doesn’t have the lovely outdoor feel of the Bahraini Farmers’ Market, nor the vastness or adventure of the Central Market, but for our needs, it’s our current favorite. Check it out and see if it works for you. The Avenues mall opened in October 2017 and we’ve been a handful of times. But, we’ve never fully explored it. So, this past weekend I took the kids and went and checked it all out. For those of you who have been to The Avenues mall in Kuwait, there are some similarities. It’s big and bright and airy with enormous interior fake palm trees. It has a wide cobblestone central boulevard perfect for ambling along (or getting your steps in on those sweltering summer days). It’s full of stores that westerners love, like Pottery Barn, West Elm, H&M, Bath and Body Works, Claire’s Accessories, and even Victoria’s Secret. It also has more than its fair share of restaurants like PF Changs, Cheesecake Factory, Shake Shack, TGI Friday’s, IHOP, Krispy Kreme, Five Guys, Texas Roadhouse, etc. Like many malls here, they do have a grocery store, however it is small. But if you’re feeling wistful for a Whole Foods or co-op feel, then hop on in. The prices are significantly higher than elsewhere in Bahrain, however they do also offer some exclusive products so you might be willing to pay for it, depending on the craving. They have a Magic Planet play area for kids. It’s very similar to the other Magic Planets around (very loud and a thousand blinking lights). The climbing structure costs 3.500 BD for an hour (bring socks) and the trampoline area costs 3BD for half-an-hour or 5BD for one hour. There are other rides and lots of games as well. The mall also has the VOX cinemas (https://bhr.voxcinemas.com/cinemas/vox-cinemas-the-avenues). They have three different cinemas, and then within those, they have different levels. First is Standard, and the tickets are 5BD for the top three rows, and 4BD for the bottom rows. We opted to splurge and try the 5BD seats. The difference, in addition to being higher, was that the top three rows come with cup holders and a little arm rest/table. Frankly, it wasn’t super worth it, but at the same time, it was just a dinar. The seats themselves look exactly the same. Finally, there’s the Theater by Rhodes. This is where the prices and amenities jump significantly. A standard ticket is 16BD and includes a reclining seat, foot rest, and a complimentary blanket and pillow. For the 29.5BD price, you can add a full meal provided by “Michelin-starred Chef Gary Rhodes”, which includes your choice of a starter, a main course, a dessert, a mocktail or beverage, and tea or coffee. We have not opted for this choice yet either, so I can’t speak to the food or service or comfort, but it all sounds fairly decadent. The mall is located in downtown Manama on Bahrain Bay, directly across from the Four Seasons Hotel. In fact, there are shuttle boats out back that will take you back-and-forth between the hotel and the mall all day long. The boat costs 1 BD per person and runs until the mall closes at night. There’s also a nice promenade out back where you can walk along the water. And during the non-summer heat, the restaurants have outdoor seating which can be very nice. The mall actually has covered parking, which in the summer temps is a great bonus. And they also have garage parking as well, located at the far end. There’s also a long promenade with four separate play areas for kids that’s off to the left of the mall. It can be quite a hike down to the far playground, but you can drive down and park closer if you want. It’s a great place for an after-dinner stroll to watch the sunset while the kids burn off those last dregs of energy for the day. 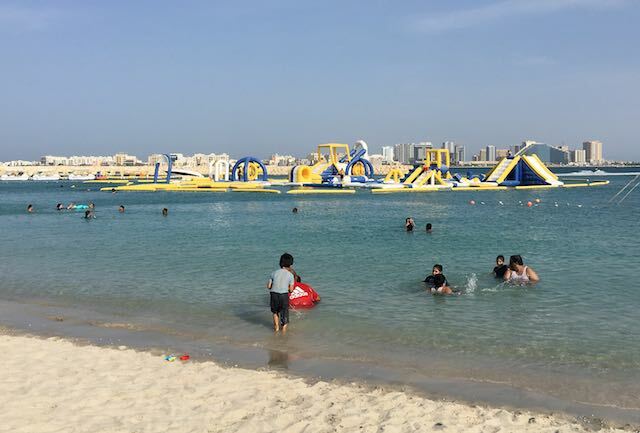 One of the nicest, cleanest, most-pleasant beaches in Bahrain is Marassi Beach. 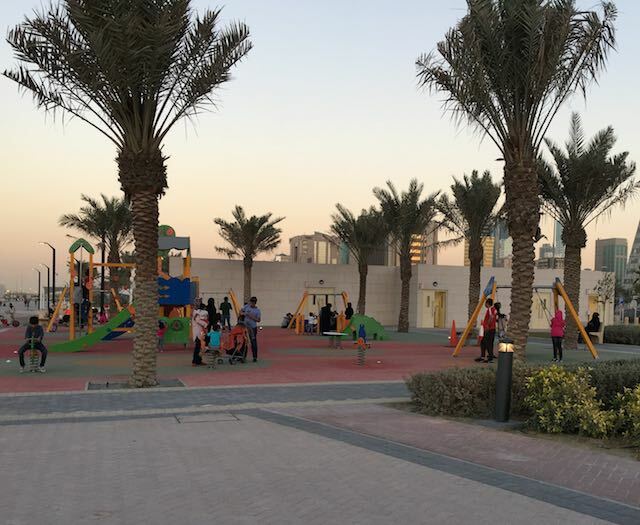 It’s located in the north-eastern corner of Bahrain, in Diyar Al-Muharraq. Just follow the signs to Dragon City and Marassi. It is a “private” beach, meaning there’s an entrance fee. However, considering how clean and tidy it was compared to other beaches here, I’m fine with paying. It costs 2BD per adult, 1BD per child (not sure of the age-range defining a “child”), and nannies are free – so feel free to bring Aunt Matilda as your nanny (just kidding). They have men’s and women’s changing areas and bathrooms located in the pink and blue containers near the parking entrance. Note that these are the only bathrooms here. There are two locations for outdoor showers, one near the bathrooms and one at the far end near the playground. There are some restaurants and food trucks here. They have signs asking you not to bring in food from outside, but I think 97% of people do it anyway. There are trash cans around, so please use them! In addition to the two beautiful beach areas, there are also tons of other things to do. They have all sorts of boat rental options: jetskis, paddle boats, kayaks, etc. and a large inflatable obstacle course (3BD per person). They also have trampolines (not sure of the cost) and a semi-shaded playground area. In addition to the beach, for the little kids, they have a large inflatable kids’ pool with 9-10 slides of varying sizes. Having three little kids, we spent most of our time here and they all loved it. Go early – the beach and activities are open from 9:00am - 6:30pm. You won’t see the crowds really start coming until early afternoon. And while the beach and activities close at 6:30pm, the restaurants stay open until midnight so it might be a nice spot for date-night to grab a bite and watch the sunset. I’m always on the look-out for things-to-do with kiddos, especially in the summer months. 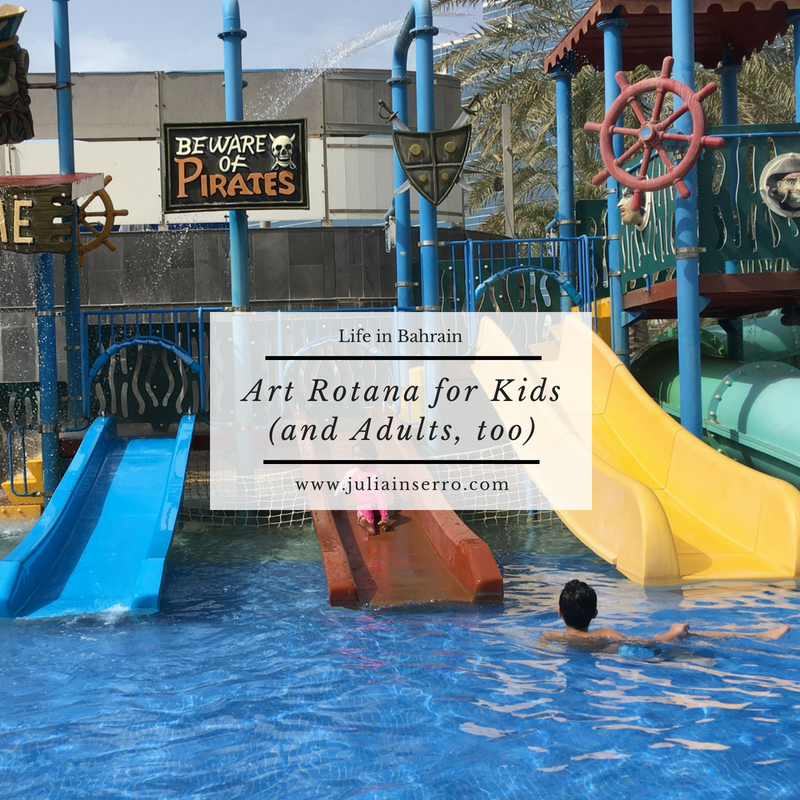 For whatever reason, we’ve been in Bahrain for two years and had never checked out the Art Rotana - despite multiple rave reviews from friends. Well, we finally did it and all the rave reviews were correct! It was fabulous and we all had far too much fun - meltdowns over the pink fork versus the blue fork were plentiful that night. There are two ways you can enjoy the Art Rotana’s amenities; get a room or get a day pass. For room rates, call them at +973 16000 111, check out their website HERE or use your favorite hotel-reservation site. For day passes, just go and get them there. 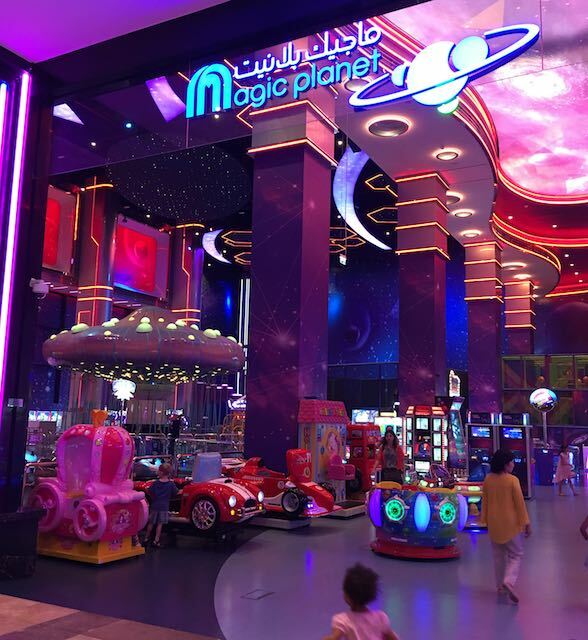 We were lucky and were able to take advantage of their Ramadan specials, just 10 BHD per adult and 5 BHD per kid, 4yo and up. During non-Ramadan times, their day pass are 25 BHD per adult on the weekends (15 BHD during the week) and 10 BHD per kid, so it was a significant savings for us. They have three pool areas, including one shallow covered ones for little kids, and a great splash area with slides and tons of fun. There were lifeguards present, which was a bonus, and they have a lovely quiet beach as well. They also have a playground, a bamboo maze, and a ping-pong table. Changing rooms with showers and bathrooms are downstairs from the pool. There’s a snack bar by the baby pool and there are restaurants in the hotel. During Ramadan the restaurants have limited hours, so check ahead. But we were able to eat lunch at Rosso, which opens at 12:00 p.m. during Ramadan. Check out their spa packages as well, they often run specials and their services are excellent. All in all, a day at Art Rotana has a little something for everyone.